Don’t look now, but the odometer for 2013 just flipped over into double-digits. All those things you were planning to accomplish just a few short months ago but didn’t, and now the sands in the hourglass are flowing, are barely giving you enough time to party. However your priorities are still steadfast. So party on you must. There is plenty to celebrate this month, like the football season; the pre-season games of our newly named NBA team, the Pelicans; cooler breezes blowing into town; our infamous Halloween celebrations at month’s end; and a whole lineup of festivals just about every weekend in all corners of our area. That means we need something festive by way of liquid refreshment, easy to make and even easier to drink, to put us in the mood, which most of us stay in anyway. But you know that. 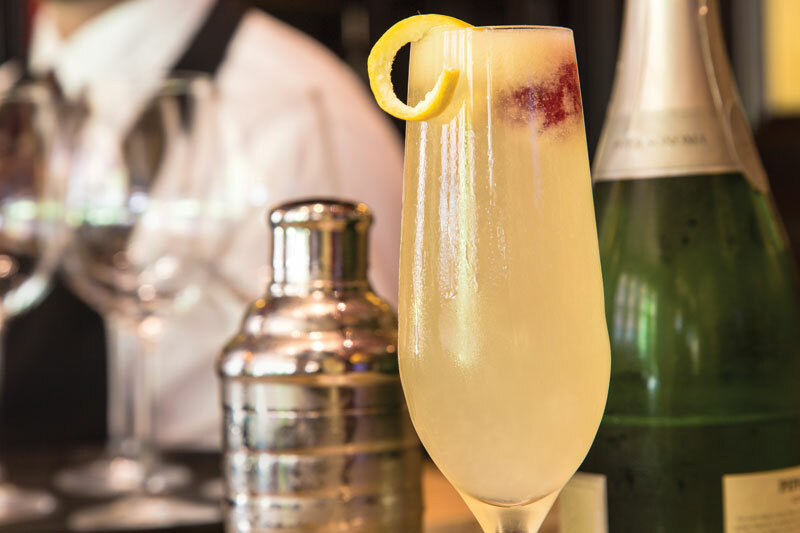 As far as favorite cocktails are concerned, the French 75 is in the top five in New Orleans. It likely never occurred to anyone, up to now, to create a French Quarter 75. The talented gang at Ruth’s Chris Steak House, led by Helen Mackey, the Vice President of Beverage Strategy (and you thought you had a cool job title? ), has solved the issue. We will all rest easier tonight, but only after a few of these. Add all ingredients except sparkling wine to shaker, add ice and shake. Pour ingredients into Champagne flute and add cold sparkling wine. Garnish with a fresh raspberry and lemon wedge. * Lemon Sour: 1 part freshly squeezed lemon juice to 2 parts sugar syrup, which is 1 part sugar to 2 parts water.